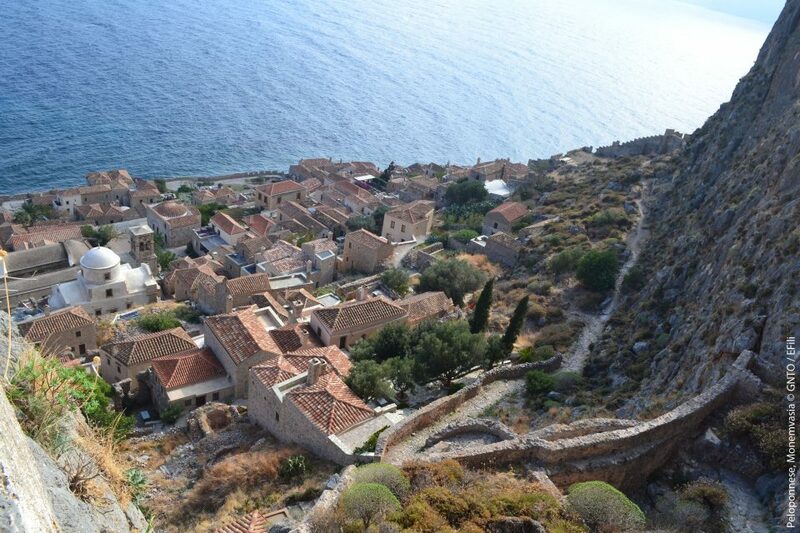 It’s worth the 3.5 hour drive from Athens to explore the medieval castle of Monemvasia in the Peloponnese. 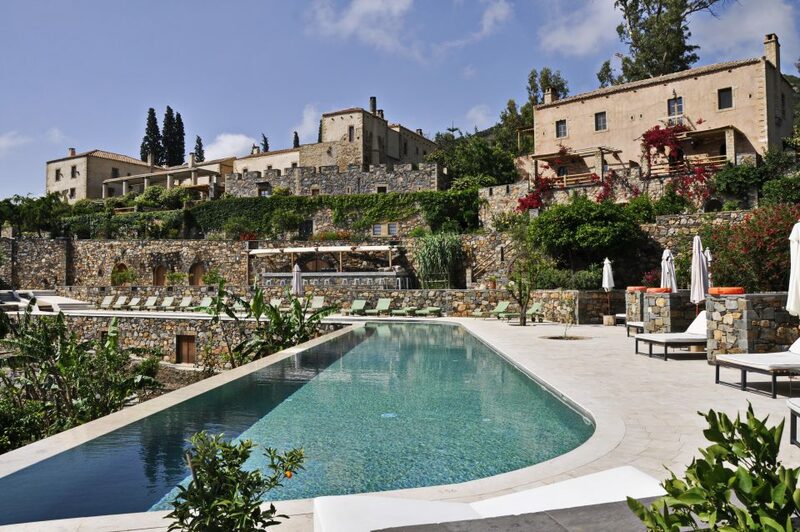 After visiting the enchanting village, the place to stay in the area is the Kinsterna Hotel, a glorious luxury boutique hotel, meticulously restored from a Byzantine-era rural mansion into 41 rooms, suites and villas. 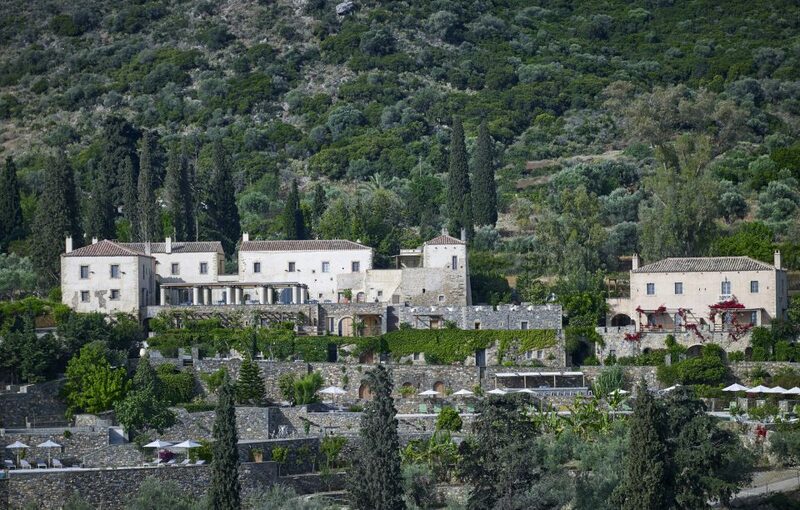 The hotel sits on a hill overlooking the rock of Monemvasia set on 4 hectares (8 acres) of lush land. 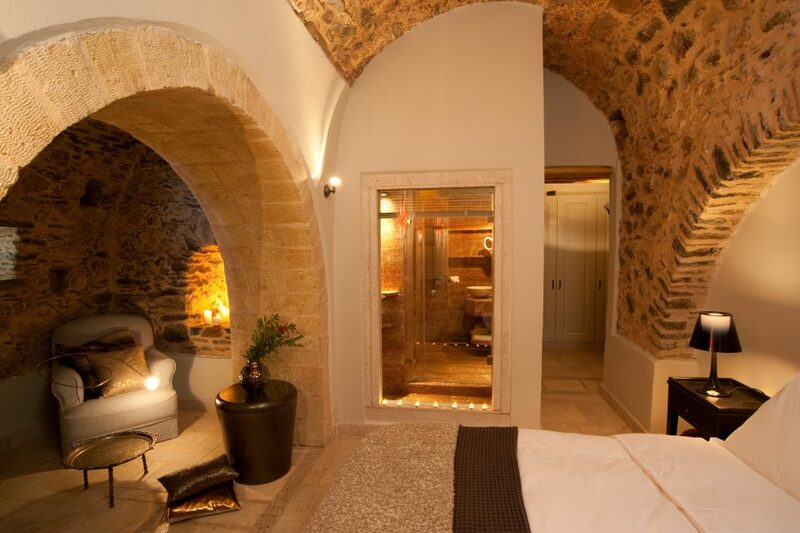 Kinsterna owes its name to the Byzantine word for the age-old cistern around which it is built, with design details mimicked throughout inspired by original relics. The owners’ vision was to turn Kinsterna into a self-sustainable and independent community. To achieve this, they revived the lifeblood of the estate with their own vineyard and olive grove and replanted fruit-bearing trees, fertile vegetable patches and aromatic herb gardens. 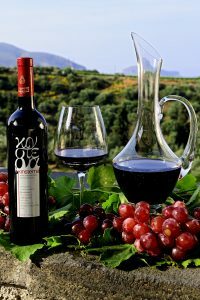 With this abundance, the Kinsterna produces its own White, Rose, and Red wine, extra-virgin olive oil, marmalades, “tsopouro” (traditional Greek bread), honey, fruit preserves, and soaps. Kinsterna is open all-year with atmospheric suites and self-contained residences that marry old-world charm with new-world comforts such as rich linens, a pillow menu and organic bedding by Coco-Mat. The impressive vaulted Byzantine suites remain true to their original architecture and are part of the mansion’s heritage with the villas coming complete with high-tech amenities, design-led furnishings and semi-private pools. 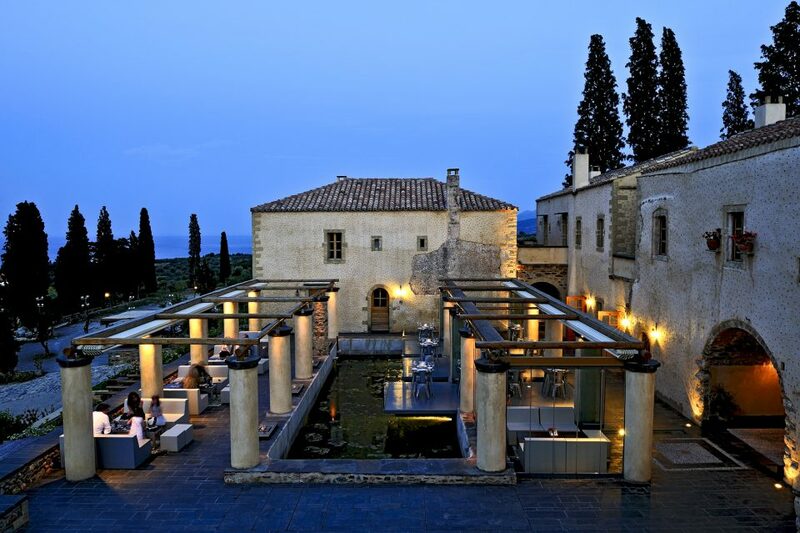 The resort serves authentic dishes and homemade Greek and Mediterranean food at the all-day restaurant with gourmet dining at the Sterna restaurant next to the Byzantine cistern. 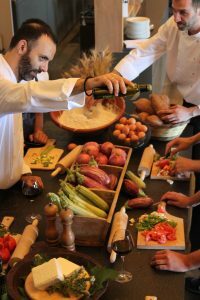 During the summer months, the outdoors Linos Taverna next to the old olive mill, the grape stomping vat and the stone wood-fueled oven is an authentic place for a genuine local meal, showcasing the foods of Laconia. Kinsterna has its own plentiful spring water supply that comes in channels and cisterns allowing ample irrigation of the lush gardens and landscape. There is a cave with a small spring on the grounds and a brook at the entrance of the estate that flows most of the year. 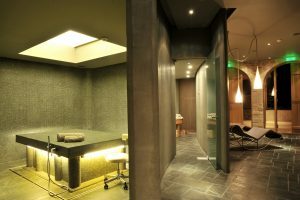 There are private relaxation areas and the tranquil Kinsterna Spa, with the purifying Ottoman hammam and the rejuvenating care of its experienced therapists. The resort has two pools of with natural spring water, one adults-only, and the other for families. 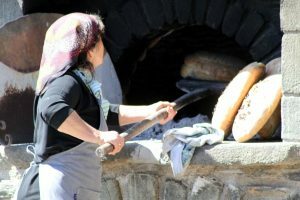 Kinsterna has restored old pastimes where guests can immerse themselves in activities such as baking country bread, soap making or participating in the production of olive oil or grape crushing depending on the season. 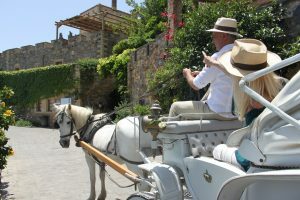 Hiking, cycling, horse and donkey riding as well as wine tasting in the wine cellar or just reading rare books in the library round out the activity options.